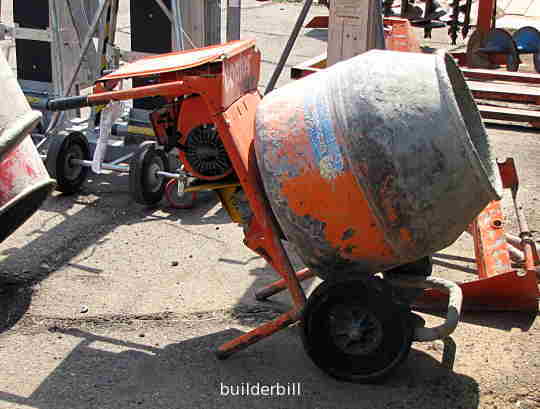 There a huge variety of machines that are capable of mixing concrete. The quality of the concrete that is mixed of course depends on the method of batching the raw materials. The amount of concrete mixed at a time depends on the size of the mixing bowl which is also usually dependant on the cost of the machine. Above is an electric driven machine that is about as small as they go. 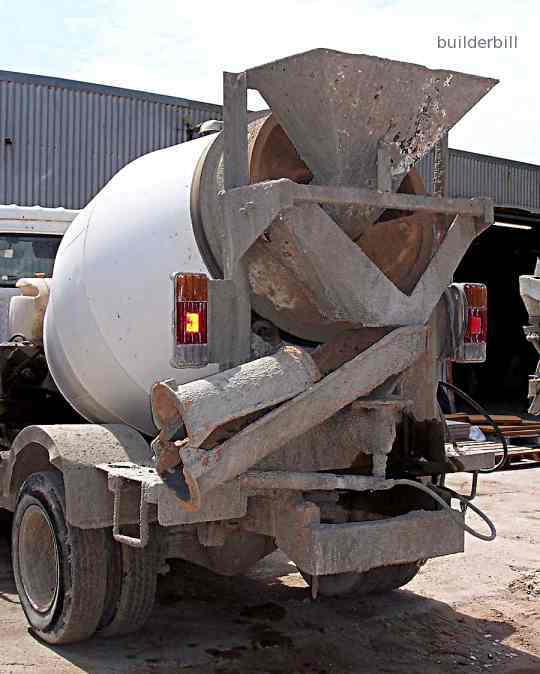 Small mixers like this can be wheeled into buildings through doorways and they are often seen permanently mounted on trailers that can carry aggregates and bags of cement. Machines of this type are usually loaded by hand with a shovel, so he quality control is low. Larger machines in the same category, say 3cu.ft. to 5cu.f.t capacity can if needed be loaded with a volume box system that will produce a consistent concrete mix. These mixers have a fixed one way rotation and the method of discharge is by tilting the bowl by hand. Here's and old toiler seen on a road near Dien Bien Phou (Vietnam) that could quite easily be be contemporary with the goings on in that town in 1955. It is about a third of a cubic yard capacity or as we used to refer to them in the old days, a two bag mixer. That is the MIXER and then the mix proportions were designed around the fact that two standard bags (56lbs) of cement were used in each mix. An accurate measure of cement and a good visual judgement of the water needed was not a bad starting point for getting reasonable concrete mix. These mixers work on the same principal as the transit mixers. Rotate one way mixes and the reverse rotation discharges the concrete. This horizontal barrel type is often used in precasting factories because of it's shorter mixing time and easy set up in a permanent installation. 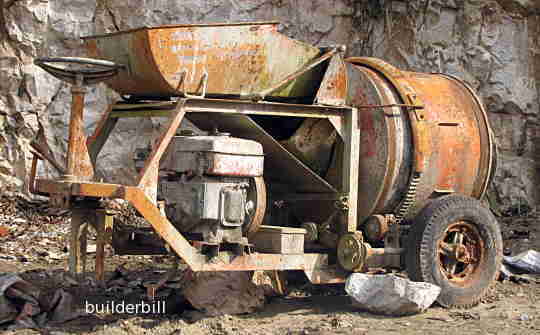 Once again in a photo of a type of concrete mixer that mixes most of the concrete for our modern buildings. The transit concrete mixer gets loaded with the dry ingredients of the mix at a batching plant that can be extremely accurate. There is no guesswork involved, most good batching plants provide a concrete mix that is exactly to specification.